You get what you measure. That's one of the fundamental truths of Quality Assessment. If people know they are being held accountable to a standard, they generally perform to that standard. By the same token, if they know they are not being measured, their behavior will often ease back into old habits (I've been able to quantify this effect with data). It's important for a quality program to keep momentum. I was recently reminded how critical it is for smaller contact centers to be prepared for turnover in their quality team. It is quite common for call centers with less than fifty seats to have one person who handles the quality process. If tragedy strikes or that person suddenly leaves, the contact center can suffer an agonizing lapse in their process. As a new person gets up-to-speed, the floor eases back into old habits and, after taking three steps forward, you find yourselves two steps behind. Wise King Solomon reminded us, centuries ago, that "two are better than one." If you are operating a quality program in a small contact center with one QA analyst, you might give thought to initiating redundancy. Make sure you have bench strength to carry you through, if and when you should need it. 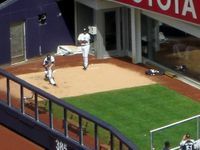 Have a person trained and warming up in the bull pen should you find your QA ace suddenly in need of relief. Great point, Tom. One of my favorite managers once said that good leaders create a “leadership logjam” behind them — cross training and mentoring others on the team so that if responsiblities need to be shifted, the team has a set of prepared leaders ready to keep the team running at full speed. Cross training can be especially important for smaller teams, as it helps relieve the stress and pressure from specialized team members. What a great word picture, Jill! “Leadership Logjam” I love it. Thanks for adding to the conversation today! Tom – good points. I’m struggling with a different issue (for the past 15 years actually). In my experience, I have failed to see quality management, as it is commonly practiced, have any measurable impact on customer loyalty and retention. Perhaps this is not the objective. But it seems to me, in many cases quality programs have taken on a life of their own in the contact center; and perpetuate because, well, just because. I’ve conducted correlation analysis between quality scores and customer retention (not customer sat scores which are bias in many cases as well). My research has confirmed others that show little if any statistical correlation. Again, maybe that is not the objective. If it is strictly an internal measure of ‘production effectiveness’, then that’s ok. Its analogous to manufacturing quality – driving towards zero defects. I don’t see that as the stated objective though. So, I wonder. If contact centers stopped doing quality, would, as you suggest, agent behavior really go to hell in a bucket? If it did, then that is more of an indictment of the recruiting, hiring and training practices of the contact center. Companies with the best reputations for customer service take a very different approach to measuring quality. And a very different approach to hiring, training and agent empowerment. Barry, thanks for your comments. You raise a HUGE and valid question. In answering, I can only rely on data from my own experience. What I can quantify with data is a correlation between improved quality scores and an increase in customer satisfaction. The key is to make sure that the things you are measuring in QA connects to what you know drives your customer satisfaction. If you can’t make that link, then you can’t expect there to be a difference in customer behavior. Many (if not most) quality programs to not link directly to any kind of data regarding their customers. I have also had the experience of measuring CSRs who believed that their calls were no longer being monitored or analyzed. The data reveals a drop in consistent service performance. I believe there are some people who will consistently perform at a high level because they hold themselves to a high level, but they are the exception and not the rule. A quality program should be built on a foundation of data about what your customers expect, and drive a standard that will meet or exceed customer expectation. When doing so, it can produce quantified increases in customer satisfaction and retention.